openSUSE offers a continuous stream of software security patches for your product. The update applet informs you about the availability of patches and lets you easily install them with just a few clicks. 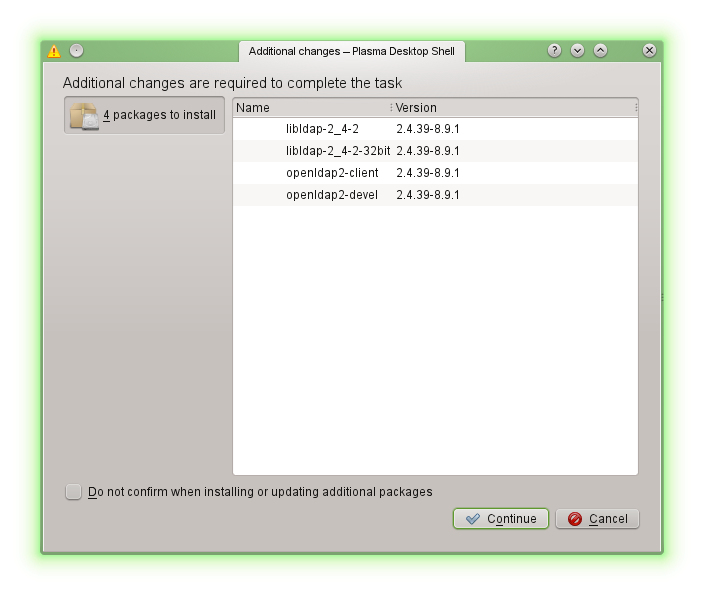 The Software Updater icon resides in the system tray of your panel depicting a gearwheel with a green arrow. To start Software Updater manually, choose System Settings+SoftwareManagement+Software Updates from the main menu. Alternatively, press Alt+F2 and enter kpk_update. Icon visibility: The Software Updater icon is only visible in the system tray, if patches are available. Hover over the icon to see the number of patches available. Whenever software updates are available, the applet icon appears in the panel. Left-click the Software Updater icon to launch the Review and Update software window. Select a patch for installation by ticking its checkbox. Get detailed information on a patch by clicking on its title. To select all available patches for installation, tick the checkbox in the table header. Click Apply to start the patch installation. In case you have started the patch installation for the first time, you will be asked to enter the root password twice in order to proceed. If you also check Remember authorization you will never be asked again to provide the password. The Additional Changes window showing an installation summary opens. Click Continue to finish the installation. The YaST Online Update offers advanced features to customize the patch installation. Please refer to YaST Online Update for more information. By default Software Updater checks for updates every 24 hours, notifies you when patches are available and does not automatically install patches. These settings can be changed with the Software Management settings. To open the Software Management settings choose System Settings+Software Management+Settings from the main menu. Alternatively, press Alt+F2 and enter kpk_settings. The settings for Software Updater are available in the Update Settings section. Patch Origin: The Software Management settings also allows you to configure the repositories (Origin of Packages) to be used. This setting not only applies to Software Updater but also to the KDE Software Management module (Get and Remove Software). Make sure the openSUSE update repository is always selected—otherwise you will not receive patches. The update applet resides in the notification area of the panel. Its icon changes depending on the availability and relevance of patches and the status of the update. To invoke the applet manually, choose Computer+More Applications+System+Software Update. Icon visibility: By default, the update applet icon is only visible in the notification area, if patches are available. Open box with a globe: The update is busy (for example checking for updates or installing software). Red Star with Exclamation Mark: Security patches are available. Orange Star with an Up Arrow: Important patches are available. Yellow Star with a Down Arrow: Trivial patches are available. Yellow Triangle with Exclamation Mark: An error has occurred. Whenever new patches are available, a notification message will appear and the Update Applet icon will be visible in the notification area. Either click Install updates in the notification message or click the icon to open the Software Update window. All security and important patches are preselected. It is strongly recommended to install these patches. Trivial patches can be manually selected by ticking the respective check boxes. Get detailed information on a patch by clicking on its title. Click Install Updates to start the patch installation. The Additional Confirmation Required window showing an installation summary opens. Click Continue to proceed. Enter the root password in the authentication screen and proceed with Authenticate. Check for Updates: Choose how often a check for updates is performed: Hourly, Daily, Weekly, or Never. Automatically Install: Configure whether patches are installed automatically or not (default). Automatic installation can be chosen for either security patches only or for all patches. Check for Major Upgrades: Choose how often a check for major upgrades is performed: Daily, Weekly, or Never. Check for updates when using mobile broadband: This configuration option is only available on mobile computers. Turned off by default. More options are configurable using gconf-editor: apps+gnome-packagekit. This page was last modified on 27 February 2017, at 20:38.